The Polish Academy of Sciences is a state scientific institution founded in 1952. It functions as a learned society acting through an elected corporation of top scholars and as a research performing organisation via its numerous scientific establishments. It has also become a major scientific advisory body through its scientific committees. PAS is comprised of 70 research establishments (institutes and research centers, research stations, botanical gardens and other research units) and auxiliary scientific units (archives, libraries, museums and foreign PAS centres). The mission of the Academy is the development, promotion, integration and dissemination of science as well as contribution to the development of education and enrichment of national culture. The tasks of the Academy comprise in particular: research activities, presentation of opinions and programs related to science and its practical application, international scientific cooperation, education in particular at PhD level, cooperation with other scientific and higher education institutions as well as with learned societies, issuing opinions on drafts of legal acts concerning science and its application as well as higher education. 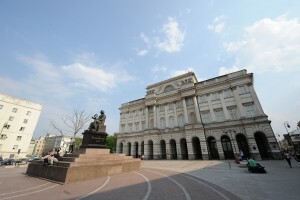 The Academy of Arts and Sciences was founded in 1872 as a result of the transformation of the Kraków Learned Society, in existence since 1815. The Academy served from the beginning as a learned and cultural society for the entire Polish nation. After the First World War the Academy was renamed the “Polish Academy of Arts and Sciences” (PAU) and became an independent, official representative of Polish learning. The PAU was a founder member of the International Union of Academies (IUA). After the German occupation, the PAU continued its activities until 1952, when the authorities decided to take over its agencies and assets on behalf of the Polish Academy of Sciences in Warsaw, which was then being established. The PAU was able to resume its activity only right after the transformation of 1989. The PAU has presently 6 Classes: Class I: Philology; Class II: History and Philosophy; Class III: Mathematics, Physics and Chemistry; Class IV: Natural Sciences, Class V: Medicine and Class VI: Creative Arts. There are also 33 Commissions, where most of the work is done. As of June 2014, the PAU had 514 members, including 150 regular members, 162 corresponding members and 200 foreign members. There are also 2 honorary members.